Teresa Looy, Compost Program Coordinator at the Green Action Centre, speaks to a full house at the town hall on climate action. 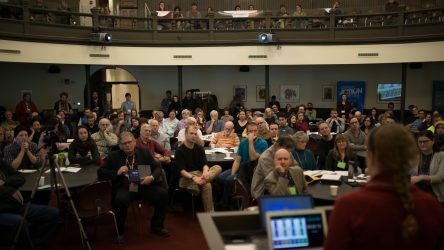 Manitoba Eco-Network, alongside organizations such as Climate Change Connection, Manitoba Energy Justice Coalition, and Wilderness Committee, gathered for a town hall to discuss the province’s five-year Made-in-Manitoba Climate and Green Plan at the University of Winnipeg Nov. 28. The plan, which claims to make Manitoba the “cleanest, greenest and most climate resilient province,” names four specific pillars which the province intends to focus on to achieve this goal: climate, jobs, water, and nature. Curt Hull, project manager for Climate Change Connection, discussed climate and jobs and provided insight on some of the actions the provincial government hopes to take regarding these two sectors. Climate Change Connection focuses on climate change in two ways: education and solution. “We work with teachers, and schools, and students, and young people, and businesses. We give presentations to anybody to listen to us. And then we also work on solutions,” Hull said. Each of the four pillars outlined in the plan is further supported by four keystones: clean energy, carbon pricing, sector emissions reductions, and adaptation. Hull said that of the four keystones supporting the climate pillar, the most important is carbon pricing, which he said will generate the revenue needed to support other building blocks. Beginning next year, the provincial government plans to implement a $25 per tonne carbon tax that will remain at $25 for the course of the five-year period. This move stands in contrast to Ottawa’s timeline for carbon pricing, which mandates provinces to introduce a minimum $10 per tonne carbon tax beginning in 2018, an amount which must increase to $50 per tonne by 2022. Hull added that the provincial government’s decision to follow a different route on carbon pricing grew out of the province’s belief that more revenue could be realized in the beginning of the five-year plan that could then be used for further reductions in fossil fuel emissions. However, Hull expressed concern regarding the effectiveness of the provincial government’s plan compared to the federal government’s plan five years from now. Hull noted that addressing issues concerning climate change would open doors to more job opportunities in the process. “If we effectively address climate, we’re also going to be reaping benefits in terms of jobs because there’s a lot of work to be done here and people should be paid for the work that’s required,” he said. 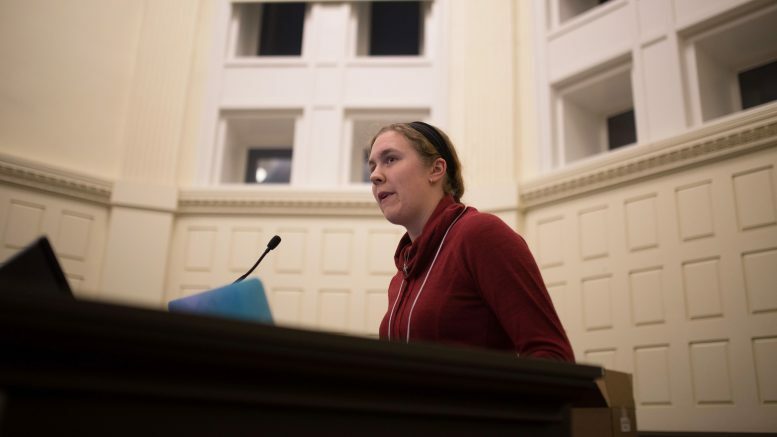 Speaking on how to make the province the most climate resilient, Hull said this involved satisfying our basic needs of water, food, transportation, and shelter without relying on fossil fuel. This, he said, can be achieved by creating climate jobs. “Ultimately, we’ve got to get to a point where we stop expanding the natural gas distribution system. Candi Bezte, water program manager with Manitoba Eco-Network, addressed the plan’s water pillar and gave an explanation on how water supply could be affected in the future. Winnipeggers gather in Convocation Hall at the University of Winnipeg on November 28 for a town hall on climate action. Representatives from organizations like the Green Action Centre, Manitoba Eco-Network, and Manitoba Wetlands spoke about potential green climate action. The Prairie Climate Centre aims to make climate change meaningful and relevant to Canadians by explaining and communicating future impacts of cliamte change through maps, videos, reports, and web content. Bezte also added that water was “the great connector” in the sense that land use practices had direct impacts on water supply. She said that this was important to note, given that our water retention capacity has decreased by a considerable amount over the years. With regards to water treatment in the province, Bezte said that a lot more data collection is required before attempting to address the issues in the province and implementing the Climate and Green Plan regarding the water pillar. Eric Reder, the Manitoba campaign director for the international NGO Wilderness Committee, emphasized the importance of maintaining a functioning ecosystem through conservation, and how this impacts on other pillars of the Climate and Green Plan. However, Reder noted that the plan is limited, insofar as there are many important groups, such as Indigenous communities, whose voices were excluded.